Is this the boy in the Messi bag shirt photo? The mystery about the identity of the boy in the homemade football shirt that enchanted the internet appears to have been solved. BBC Trending has been told that the child who has become known as "Messi's biggest fan" is actually five-year-old Murtaza Ahmadi from a rural area in Afghanistan. This would appear to contradict reports that the boy is an Iraqi Kurd. The online quest to find the unknown boy was sparked by a single photo of the back of a child wearing a Lionel Messi shirt made from a plastic bag. The photo went viral as did claims that the boy was an Iraqi Kurd and that the Barcelona football star wanted to find his young fan to give him a proper shirt. Azim Ahmadi, an Afghan living in Australia has posted pictures of his nephew Murtaza who he says is the boy in the original photo. A comparison between his photos and that of the mysterious Messi fan shows that there are striking similarities. Azim put BBC Trending in touch with his brother Arif, Murtaza's father, who answered his Afghan mobile and confirmed his son was indeed the boy that the web has been searching for. Arif said the original photo of Murtaza wearing the plastic shirt was taken by his oldest son Hamayon who published them on his Facebook page. The family live in the Jaghori District, in the eastern Ghazni province of Afghanistan. 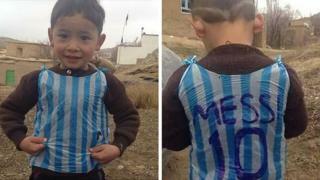 Arif said: "This little kid really loves Messi and football. It is not possible for us to buy [a jersey] for him. Because I am a simple farmer. So the kids decided to use the plastic." The father says Murtaza knows that he is famous now and "he is extremely happy". "He heard from friends who have internet. They called and told us about it". My younger son is also hoping that foreign countries help us meet Messi and if we could be good football players like him in the future." If the claim that Murtaza is the boy in the photo is fully substantiated then it will contradict reports on Kurdish TV which had identified another boy in Iraq as being the one. Kurdistan TV had reported that a boy called Homin was the subject of the photo. They claimed that they had located him in Dohuk, which had been where the search effort had originally concentrated on. Image caption Kurdish TV has claimed that another boy in Iraq is actually the one in the photo. However, as BBC Trending reported last week the source of the online rumours that the picture was taken in Dohuk has admitted he made the whole thing up. A Swedish high school student with the Twitter handle @illMindOfRobin told Trending that he had planted the rumour on Twitter that the boy came from Dohuk as he wanted to draw attention to the town where his family was from. Trending heard about Murtaza after his uncle contacted @illMindOfRobin to tell him that his nephew was the real boy in the photo. But unless Trending has now been the victim of very skilful hoax the mystery appears to have been solved. Next story: Do white rappers benefit from 'white privilege'?